The Bibbulmun Track is Western Australia's longest walking track. It has been designed to be similar to the Appalachian Trail in the USA and runs from Kalamunda (a suburb in Perth) for 963 km to Albany (the largest and oldest town on the southern coast). It is the second longest walking trail in Australia and proposals exist to extend the track further east along the coast, which could make it into the longest trail. The track has good services with three sided shelter huts which have bunks, tank water and tables. Near each hut are also tent sites for those who want to camp or prefer to separate themselves from hut occupants. The track passes through native forest for most of its length, there are only a few short sections through pine plantations or across farmland. While most of the forest is native, much of it used for logging - the most visible effects are tree stumps and regular fire blackened trees that result from forestry management practices of controlled burns. The track does pass through some national parks, which are mainly along the southern coastline. The track has been re-aligned several times over the last 20 years. 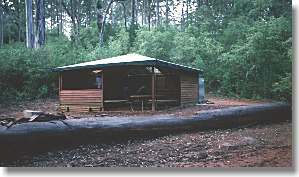 It was constructed by CALM (Conservation and Land Management) who are responsible for managing the forests and is maintained by both CALM and a very active 'Friends of the Bibbulmun Track' group.